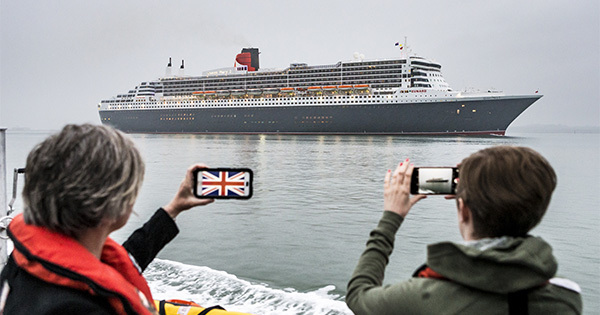 Cunard Line's QM2 Cruise Ship Arrives in Southampton Following £90m "Remastering"
(2:45 p.m. GMT) -- Following a £90m 25-day dry dock "remastering," Cunard's Queen Mary 2 sailed into Southampton this morning ahead of its first post-refit Transatlantic crossing. QM2 left the Blohm + Voss shipyard in Hamburg, Germany, on Tuesday June 22, where the ship received its most significant update in its 12-year history. Celebrations will mark the ocean liner's refit and arrival in Southampton today, including a VIP reception, private tours and a lunch, before the ship sets sail for New York. The refit includes the introduction of 15 new single staterooms -- a first for the ship -- and five more inside cabins. Thirty additional Britannia Club Balcony cabins have been added, giving more passengers access to the exclusive Britannia Club. The Britannia Balcony cabins benefit from brand-new soft furnishings, a new sofa, telephone and -- much to the delight of British passengers -- the introduction of tea- and coffee-making facilities. The Queens Grill and Princess Grill suites and restaurants have received a complete redesign and refurbishment. The Carinthia Lounge, replacing the ship's former Winter Garden, will host passengers from morning until late at night. Passengers can enjoy breakfast, followed by a selection of snacks, pastries and illy coffee throughout the day, while live music and cocktails will see passengers use the space for pre- and post-dinner drinks. There are 10 new kennels for the ship's four-legged passengers, bringing the total to 11 small and 11 large kennels. There is also be a new pets play area inside the Kennel Suite and a larger outside walking area, plus an original 1916 lamppost that once lit the street just a few blocks away from the company's original headquarters in Liverpool. The glass elevators in the ship's main lobby have been removed to create a more expansive and user-friendly public space for passengers. The same design principle has been applied to the Kings Court Buffet, which is undergoing a total transformation. A bank of elevators has been removed to make way for a central serving station, which will also reduce the number of entrances and exits to the buffet to make the flow of traffic less chaotic. A section of the photography gallery has been replaced with a new wine room, where some of the ship's wine collection will be stored and a sommelier will conduct themed tastings. Senior vice president of Cunard Simon Palethorpe said: "Remastering Queen Mary 2 honours the heritage and iconic status of our magnificent ship to take our passengers forward into a new era of ocean travel."